After studying at Berklee College of Music, joined the Clark Tracey Quintet, Julian Joseph Quartet and Nigel Kennedyâ€™s Wasp Factory. While living in New York he played with the Duke Ellington Orchestra and joined the Dave Brubeck Quartet. Alec performs with Cleo Laine, Jacqui Dankworth, Georgie Fame and has worked with Van Morrison. 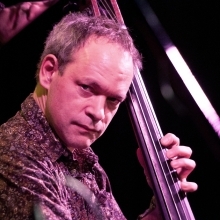 The Alec Dankworth Trio's debut album â€˜If Youâ€™re Passing Byâ€™ was released in 2003. Alec has performed with Mose Allison, Guy Barker, Stephane Grappelli, Johnny Griffin, Abdullah Ibrahim, Marian McPartland, Courtney Pine, George Shearing, Tommy Smith, Clark Terry and Mel Torme. He has performed at Carnegie Hall, the Hollywood Bowl, the Sydney Opera House and the Royal Albert Hall.